Connecticut once again saw a year-over-year increase in the number of fatal drug overdoses, with 1,038 in 2017, compared to 917 in 2016. It was the first time the state had more than 1,000 accidental overdose deaths in a single year and nearly triple the amount in 2012, according to the Connecticut Office of the Chief Medical Examiner. The law firm of Ventura Law has been a major force in Connecticut in its fight against opioids, representing numerous cities against the manufacturers of opioids, including Danbury and Norwalk. To further its support of these cities, which have suffered tremendously from the destructive effects of the opioid epidemic, the firm has donated $20,000 to the Western Connecticut Health Network (WCHN) for the specific purpose of purchasing Naloxone (Narcan) and supporting the personnel who assist those who have overdosed from opioids in the cities of Danbury and Norwalk. Ventura Law was hired by the Danbury City Council to represent it in potential litigation against some of the nation’s largest pharmaceutical companies for their alleged role in causing the opioid crisis. On June 12, Ventura Law, along with their co-counsel, Branstetter Stranch & Jennings, filed a lawsuit on behalf of Ansonia, Danbury, Derby and Norwalk against opioid manufacturers, distributors and a former executive in Connecticut Superior Court. The lawsuit also includes claims that the drug companies violated Connecticut’s consumer protection statutes and created a public nuisance by disseminating false and misleading statements about the risks and benefits of opioids. Some of the false marketing tactics deployed by these companies included branded and unbranded advertising, misrepresentations by sales representatives and the use of front groups and key opinion leaders to deliver information that downplayed the risks and inflated the benefits of prescription opioids. To help increase public awareness, the State of Connecticut recently launched a new campaign called “Change the Script” to highlight the problem of opioid abuse. The educational campaign focuses on prevention, treatment and recovery. It also seeks to change public perception about addiction to that of a chronic disease instead of a choice. For more information on the campaign, visit http://www.ct.gov/dmhas/site/default.asp. 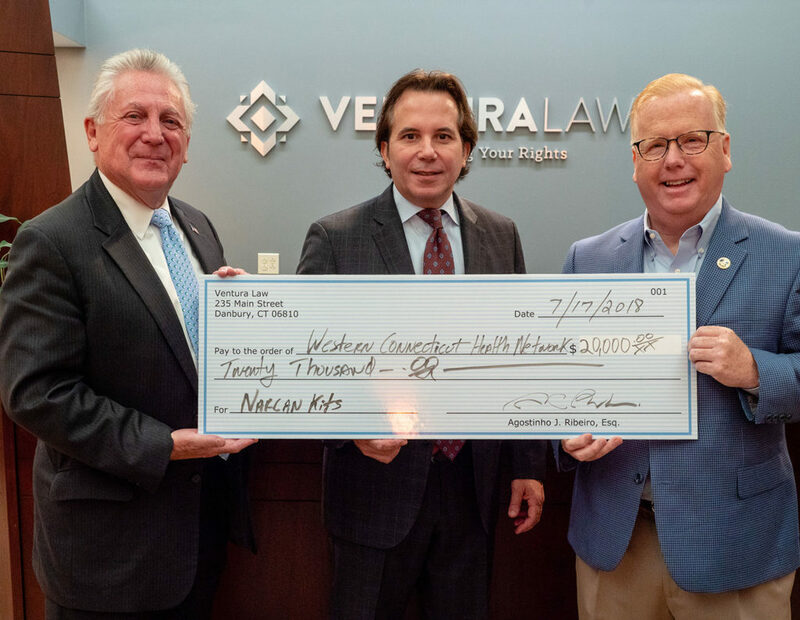 “Ventura Law helps build healthy and vital communities by supporting organizations and initiatives which make a positive difference through Fairfield County and the State of Connecticut,” concluded Atty. Ribeiro. The $20,000 check presentation ceremony took place on July 17 at Ventura Law’s office at 235 Main Street in Danbury. For more information about the law firm, visit www.venturalaw.com.